Bruce performed the song 65 times and played it during every show of the Seeger Sessions tour. ".. this is a, uh, our first, the first official job was in New Orleans at the New Orleans Jazz and Heritage Festival….was, uh, exciting to play, to play down there particularly this year and uh….it´s hard to explain New Orleans, I´ve been telling the folks every night, New Orleans isn´t like anything you´ve ever physically seen before, there´s, uh, the amount of devastation, people lost close to a hundred thousand homes and half the, almost half the population of the city, uh, very, to ride, to ride through an American city that, so much of it´s been just literally emptied out and wiped off the map, was something I can´t quite explain but uh….it´s, uh….if you´re a musician, New Orleans is, uh, of course sacred ground, so much of the roots of the music that we´re playing here tonight, uh, came from overseas, ended up there, got mixed up and turned into rock and roll and folk and jazz and blues and rhythm and blues, it´s a city where so many beautiful things and, and beautiful people came out of, it´s, it´s contributed so much to the soul of American culture, uh, that it can´t be overstated, it really can´t be overstated, and it´s also one of the few places that when you go there, it was always still there there, it hadn´t been malled or Disneyfied, it was still pretty funky in parts (chuckles) and, uh, you could just, you know, the sense of the place was still in the streets, you could still walk down the street and see terrific musicians playing, playing on the street, brass bands playing on the street and, uh….so, uh, you know, all those musicians owe a large debt, a large debt to what came out of New Orleans and it´s a place where really the whole nation, you know, owes to keep its eye on what´s going on down there ´cause it´s contributed so much to our lives and our culture so, uh….bearing in mind, this was something that, uh, there was a song we came across called, by a guy named Blind Alfred Reed, called ´How Can a Poor Man Stand Such Times and Live?´ I kept the first verse and, in the folk tradition, I added three more in, uh, in honor of our president´s unfortunate visit down there where he managed to sort of gut, gut the only agency that´s there assisting Americans in times of disaster through political cronyism but….we´ll let the music do the talking…." "How Can a Poor Man Stand Such Times and Live? " is an American folk song originally recorded on December 4, 1929 in New York City. 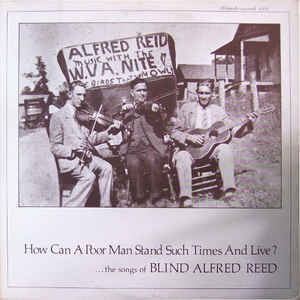 It was written, composed, and performed by Blind Alfred Reed, accompanying himself on the violin. The song tells of hard times during the Great Depression. It is considered an early example of a protest song. There was once a time when everything was cheap. But now prices almost puts a man to sleep. Tell me how can a poor man stand such times and live? "Jon Landau, my manager, sent me a tape of Ry Cooder doing the song, and I just liked it musically. He kind of sang the Blind Alfred Reed lyric, but for me there was a place to make it more current." 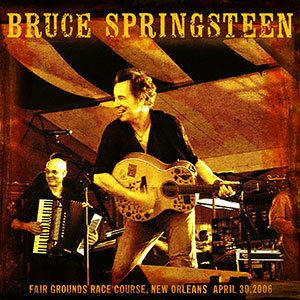 Springsteen reworked the song for his Seeger Sessions tour. He kept only the last verse from Blind Alfred Reed's version, and wrote 3 additional verses related to the Gulf Coast (New Orleans) disaster and its aftermath. It is reported that he did record the song in studio with the Seeger Sessions Band during the last of the three "Seeger Sessions", but he did not include it on his 2006 cover album, We Shall Overcome - The Seeger Sessions. Bruce and his Seeger Sessions band played the song at a "private" rehearsal on 13 Apr 2006 at the Convention Hall, Asbury Park, NJ. The song was played during all 4 public rehearsal shows for The Seeger Sessions tour: 20, 24, 25, and 26 Apr 2006 at the Convention Hall, Asbury Park, NJ. And he says "in a little while you'll be alright"
And what happened to you poor black folks, well it just ain't fair"